Ontario's long-running Mariposa Folk Festival is set to return to Orillia for another year, and ahead of the July event, organizers have revealed the lineup for the fest's 2018 edition. Topping the bill are Walk Off the Earth, Larkin Poe, Alan Doyle, Nick Lowe & Los Straitjackets, Buffy Sainte-Marie and Bahamas. The fest's lineup also features Bill & Joel Plaskett, Birds of Bellwoods, Danny Michel, Fast Romantics, Fred Eaglesmith, Good Lovelies, Iskwé, Land of Talk, Leif Vollebekk, Lisa LeBlanc and many more. 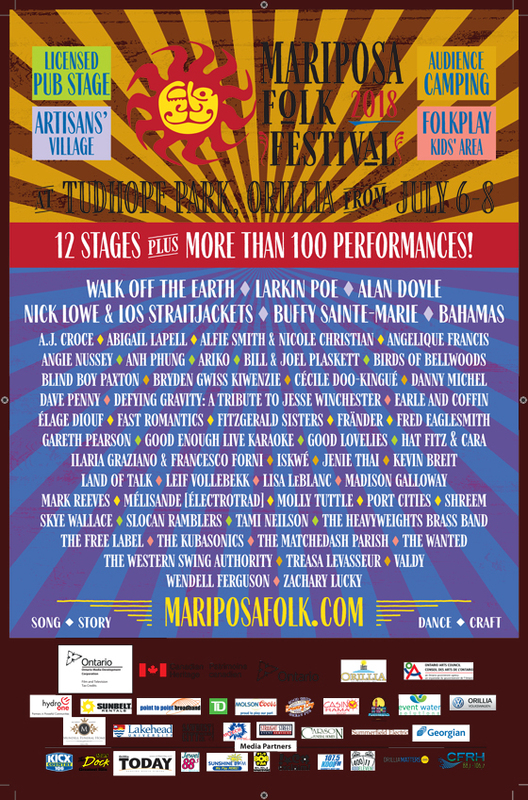 The 2018 edition of Mariposa Folk Festival will take place from July 6 to 8 in Orillia's Tudhope Park, with more than 100 performances taking place across 12 stages. Tent and RV camping is available on the festival site. Further ticketing and festival information can be found through Mariposa's official website.